Mathematics, along with English, is a core content area that transcends disciplines. Math is used in biology, chemistry, engineering, statistics, and many other subject areas. It is also an area in which students tend to struggle. Educators on all levels and in many disciplines have come together in the math transitions meetings to discuss how to better align lessons, learning expectations, and scores between the K-12 and post-secondary levels. These events are coordinated by the Wyoming School-University Partnership, the University of Wyoming Department of Mathematics, and Wyoming community colleges. Some events were funded by support from the Qwest Foundation. Registration is free, but required. Dinner Thursday night and breakfast Friday morning will be provided. All travel and lodging expenses are participants’ responsibility. PTSB renewal credit will be available for Wyoming certified teachers. 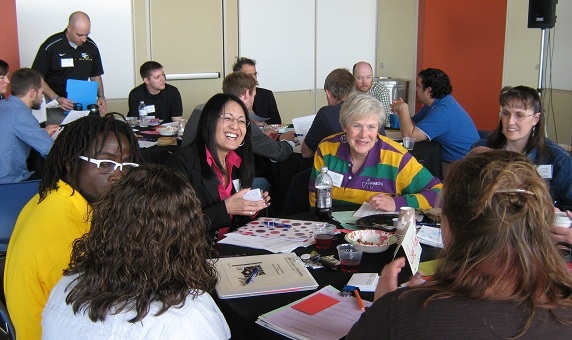 The Partnership's Mathematics Institute is connected to this year's Mathematics Articulation, as the Articulation meeting will begin after the Institute on Friday afternoon (April 7), and go until Saturday afternoon (April 8). Like in past years, the Partnership plans to pay the registration fee for all K12 educators who go to the Mathematics Articulation meeting ($55). To learn more, scroll down. Foster conversation and collaboration about mathematics, calculus in particular. Examine and discuss expectations, strategies, and learning culture for college/university readiness. Revise and update Partnership Trifold Disciplinary mathematics document (e.g., bookmark, brochure, poster), and brainstorm components of online, interactive, digital presence such as infographics and website. Learn updates about and participate in the review process of the Wyoming state mathematics standards. 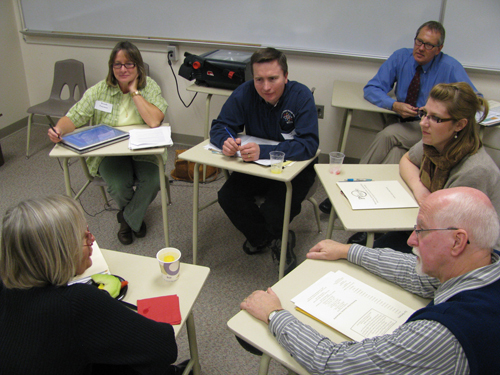 Examine resources to improve collaboration and communication, as established by standards of the National Alliance of Concurrent Enrollment Partnerships (http://www.nacep.org/) and the Higher Learning Commission (https://www.hlcommission.org/). 7:00-8:30 Working Title: The State of Calculus in Wyoming and Beyond Panel discussion moderated by Jess Ellis, Colorado State University. Evidence-based research in education supports the use of classroom methods that encourage student engagement in learning. Providing an environment that prompts students to analyze their own learning promotes the development of metacognitive skills, and has been shown to enhance learning. This is particularly important in mathematics courses, since a robust understanding of mathematics underpins success in other STEM disciplines, and is therefore essential for supporting increased persistence in STEM fields. To address this problem, we have designed a model that incorporates a variety of active teaching and learning strategies in the calculus classroom. Participants will engage in sample activities, read sample student responses, and discuss strategies for implementing in their own classrooms. Join us for more information about calculus during the Friday afternoon and Friday evening WYMATC articulation following the Partnership Institute. The Wyoming Mathematics Articulation Meeting will begin Friday afternoon (April 7) after the end of the Partnership's Mathematics Institute meeting, The Institute and Articulation meetings are two separate, but connected meetings, and if you plan to attend the Mathematics Articulation meeting, you will need to register for it separately after completing this registration. Like past years, the Partnership plans to pay for all K12 educator's registration fees ($55). Please indicate your a K12 educator and the Partnership will pay for your fee when you register. Conference focus: "Student Engagement, Motivation, and Persistence"
Conference focus: "Overviewing the Mathematics Common Core, and Examining College Algebra Principles: Going Beyond Memorization"
Conference focus: "Designing Mathematical Experiences that Matter"
Conference focus: Bodies of evidence and "Understanding by Design"
Reading assignment, excerpt from Understanding by Design by Grant Wiggins and Jay McTighe (2005), pp, 35-55. Wyoming Department of Education's Body of Evidence peer review scoring guide (Spring 2009).